How much riding experience must I have? You must have the ability to handle a large motorcycle in a variety of road and traffic conditions. If you have been riding a 600cc or larger motorcycle for at least a year, you should be fine. 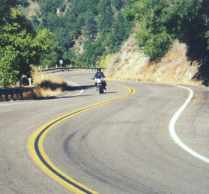 Completion of a motorcycle safety course is recommended. All riders must have a valid motorcycle operator's license or endorsement on their drivers license. I used o ride when I was younger, but haven't ridden for several years. Will I be ok on these tours? 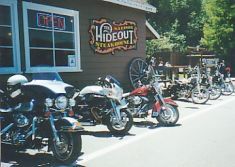 We strongly recommend that "re-entry riders" (those who used to ride and have now re-entered the sport) take a refresher course and then beg, borrow, or steal (or buy) a motorcycle to log some miles before coming on one of our motorcycle tours. The bike you rode years ago was probably a lot smaller and lighter than any of the modern Harleys. For your safety and that of your passenger, it's really important that you are truly capable of handling a heavy-weight motorcycle in a variety of road, weather and traffic conditions. Getting some real-world seat time is the best way for you to gain confidence in your ability to handle a heavy weight cruiser. Why would I take a guided tour when I could just get a Harley rental and a map? You could do that, but you will most certainly miss some of the best roads or interesting side trips that you can only find after years of trial and error. Maps show the primary and secondary roads, but don't do such a good job with the tertiary roads that are often the most fun, scenic, and lightly traveled. We go out of our way to find those roads, since we focus on the journey, not the destination, and dislike riding on freeways! Plus, on your own you'd have to make your hotel bookings in advance without knowing the area or seeing the properties. We book accommodations in historic lodges, bed & breakfasts, or hotels that are distinctive and offer the "right" atmosphere for a bike tour. CMT's tour prices seem higher than some other tour company prices - why? If you are comparing our prices with those from other tour companies, please note that our tours include all lodging, all meals, motorcycle rental and all fuel. Most other tour companies don't include most meals and don't include fuel. Our repeat riders think our prices are a bargain! Do I have to ride with the group? No, you can travel at your own pace, take side trips or stop along the way if you so desire. The only requirement is that you get to our daily destination in time for dinner. If I don't ride with the group, how will I know where to go? Each day you will be given an itinerary with a map showing primary and alternate routes. This includes directions to the hotel for that night. However, there are a few instances where you will find it advantageous to stay close to the guide to avoid getting lost. What weather conditions should we expect? Do we ride if it rains? Yes, but this is rare. Usually we can wait out a short duration storm. Our tour schedule is designed to avoid rainy periods, but occasionally we encounter a morning rain or afternoon thundershower. Is there a chase vehicle? Usually, no. The exception is the Mexico Madness Tour where we WILL have a chase truck; there's no AAA in Mexico. If we don't have a chase vehicle, what will I do with my luggage? After you book your tour, CMT will provide you with a list of recommended clothing and riding gear which can be packed in the saddlebags and trunk of the various bike models.Our philosophy has always been that if you're going to tour on a motorcycle, then learn to bring only what you need; be self-sufficient. You don't need a steamer trunk full of clothes you're never going to wear. If you come with extra luggage and extra clothing, it can be safely stored at the CMT office during your tour. What happens if a motorcycle breaks down? If we encounter a problem that can't be readily repaired on the road, the motorcycle will be towed (trucked) to the nearest H-D dealer or repair facility. If the bike can't be readily repaired, CMT will make arrangements for a replacement motorcycle from the local rental agency. Today's motorcycles are nearly as reliable as the car you drive every day, so breakdowns are rare. All of our motorcycles have liability insurance, which covers damage to others. VIP collision and comprehensive insurance with a $1000 deductible is available for $24 per day  this means you would be responsible for the first $1000 of damage. There is no medical coverage for the rider or passenger so we strongly advise you to secure your own accident and/or trip interruption insurance. Do the tours include airfare? No, but CMT will be happy to assist you with travel reservations or bookings. Contact us if you would like our help or advice in this area. Yes, you can ride your own motorcycle. Please contact us for tour rates. If you want to ship your bike, we will put you in touch with a freight company that specializes in motorcycle shipping within the U.S.
What riding gear and clothing should I bring? After you reserve your place on a tour, CMT will send you a list of suggested clothing, riding gear, and incidentals. We do not have riding gear available so you must supply all of your own gear. What expenses will I have? On the multi-day tours, you'll only need to pay for alcoholic beverages, and incidentals (souvenirs, etc.). On the Day-Tripper tours, you'll need to pay for breakfasts and dinners (except for the welcome dinner), alcoholic beverages and incidentals.